We suspect that many tombs and monuments were aligned to or mapped the movement of the sun and moon but what about houses? Today we are aware of Feng Shui, a practise that was widely used to orient buildings— including houses —in an auspicious manner. Depending on the particular style of feng shui being used, an auspicious site could be determined by reference to local features such as bodies of water, stars, or a compass. Archaeologists suspect that prehistoric houses were also carefully aligned and maybe used in a proscribed manner. 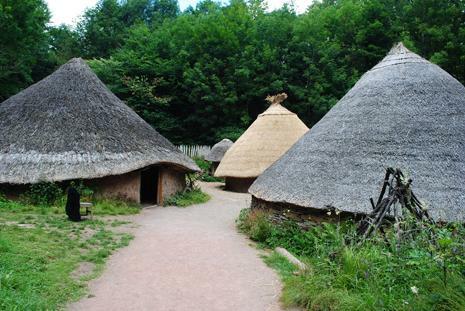 You may have seen a reconstructed Iron Age roundhouse – made up of a circular ring of posts, in-filled with wattle and daub or with stonework with pitched rafters holding up a conical thatched roof. These structures were common throughout Britain from the mid-Bronze Age until the Roman period. But, they were far from just simple dwellings to keep out the wind and rain – they were the focus around which much of prehistoric life must have centred. There is little evidence for large communal halls or specialised housing at this time so It was here that people prepared and cooked food, entertained guests, undertook their daily tasks and crafts, slept, and occasionally sheltered their livestock. These were sensual places, dark places, smelly places – not least from the smoke from the hearth as there were no windows or smokeholes – and filled with furniture, pottery, stored food and the chattering voices of the occupants. Excavated roundhouse – Parc Bryn Cegin, Llandygai Gywnedd Archaeological Trust. But, archaeologists have recently realised that the use of space in these houses was closely controlled and managed. In the late 1990s, Alistair Oswald noted that the doorways of these later prehistoric houses tended to face east or south-east towards the rising sun (Oswald 1997). Also, where intact floors have survived, such as at the southern English hillforts of Danebury or Maiden Castle and in the Scottish Isles, archaeologists have noted a variable distribution of household debris arranged around the central hearth. Right across Britain consistent patterns of material within these houses suggest that with the doorway orientated to the east, the cooking area was in the south-east, the working area in the south-west and the sleeping area along the northern side. 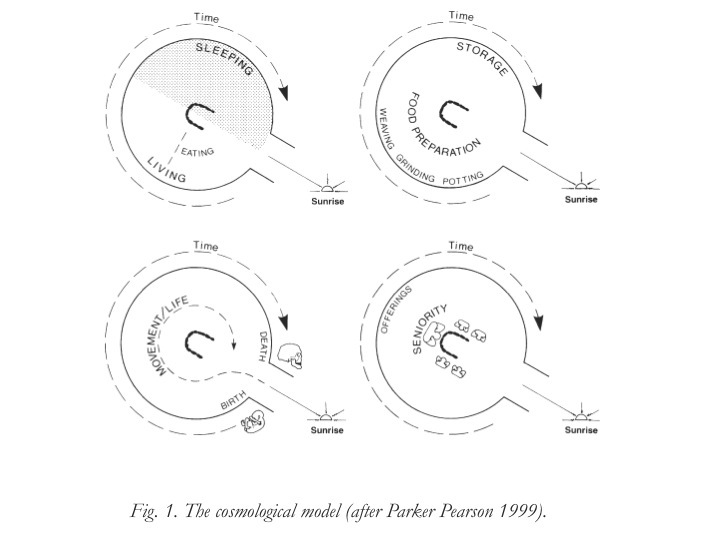 Some archaeologists have argued that this layout was a cosmological structuring device that matched the passage of the sun over the course of a single day and night (Fitzpatrick 1994) or even that this circular, clockwise (also known as sunwise), movement around the house may have represented the life cycle from birth to death (Parker Pearson 1996). Other archaeologists suggests that this is not the case and it is more likely that environmental conditions (such as wind direction and light intensity) dictate how houses are orientated, built and used (Pope 2007) . In either case, it’s clear that roundhouses were not simple huts, but sophisticated structures imbued with powerful symbolism that accompanied their construction and dwelling. Fitzpatrick, A. 1994. Outside in: the structure of an Early Iron Agehouse at Dunston Park, Thatcham, Berkshire. In A. Fitzpatrick and E. Morris (eds). The Iron Age in Wessex: Recent Work, 68–73. 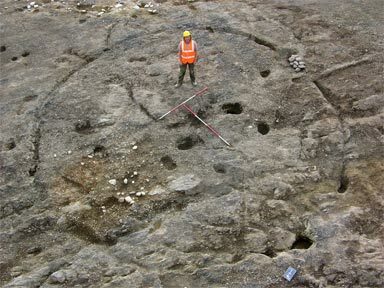 Salisbury: Trust for Wessex Archaeology. Oswald, A. 1997. A doorway on the past: practical and mystical concerns in the orientation of roundhouse doorways. In A. Gwilt and C. Haselgrove (eds). Reconstructing Iron Age societies, 87-95. Oxford: Oxbow. Parker Pearson, M. 1996. Food, fertility and front doors in the first millennium BC. In T.C. Champion and J.R. Collis (eds). The Iron Age in Britain and Ireland: recent trends, 117-132. Sheffield: J.R. Collis Publications. Pope, R.E. 2007. Ritual and the roundhouse: a critique of recent ideas on domestic space in later British prehistory. In C.C. Haselgrove and R.E. Pope (eds) The Earlier Iron Age in Britain and the near Continent, 204-228. Oxford: Oxbow.